100% browser based, no client install. Simple to use graphical editor. With our easy to use, graphical editor, non-technical people have the power to build scripts quickly and easily, deploying campaigns faster than ever before. With controls and tools to enable you to integrate with your telephony and back office applications seamlessly, CallScripter will reduce your Agent AHT and slash your training time while increasing 1st Call Resolutions and Sales Conversions. Imagine being able to empower all your agents to perform to the standard of your best agent! Available in the cloud or installed on your premise, licenses to rent or purchase and the option to flex up and down according to demand; we have a flexible offering to meet every situation. Contact us today. CallScripter Synergy is the brand new application from CallScripter. The term Synergy comes from taking two elements and combining them to produce something of greater value than the two separate parts. CallScripter has taken the functionality of previous versions and combined it with a simplified user interface and smarter controls to create a lighter, quicker, easier and more consistent application. CallScripter is a toolkit which provides contact centres with the necessary features to design powerfully dynamic agent desktop solutions that meet your exact business requirements. Deployed as a standalone scripting tool or a fully integrated agent desktop and all presented within a single application window. Originally developed for our outsourced contact centre, CallScripter has been designed to meet the demands of today’s dynamic contact centres and is one of the most comprehensive solutions on the market. Whether your focus is on Sales, Customer Services, Retention, Collections, Telemarketing or Fundraising, CallScripter will provide your people with the toolkit to revolutionise your customer communications. The user interface allows customer advisors to handle all their interactions in one unified desktop. The desktop can be easily customised for each campaign and tailored to incorporate customer information. CallScripter Synergy’s consolidated desktop allows the agent to relax into the interaction, confident that they are delivering the correct service, this allows agents them to build a relationship with your customer while offering an exceptional service, raising the overall quality and consistency of your advisers. This client case study illustrates some major improvement in customer satisfaction and increased sales as a result of implementing CallScripter. 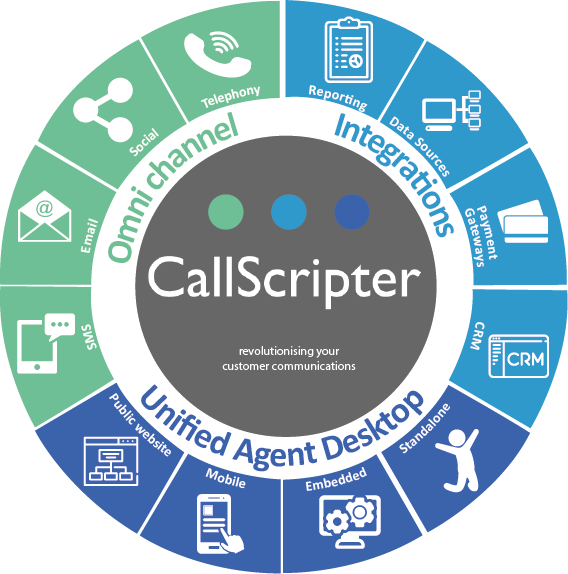 One of CallScripter’s key features is our ability to integrate with your telephony platform as well as your CRM and other applications through a simple wizard-driven configuration or using standard APIs. The consolidated desktop allows your organisation to bridge gaps between your systems and streamline processes. We even have our specific integrations for our larger partners. Just ask to find out more. The challenge to remain compliant is common to businesses in many industries and markets. The regulatory bodies may differ by industry and territory, but the same underlying problem affects all; that companies need to implement processes, control and auditing into operations while delivering high standards of service, This is neither easy nor cheap. The last five years have shown ever tightening regulations in many sectors; Healthcare, Financial, Telemarketing for instance. This trend is likely to continue, and while the cost of implementing change is real, the penalties for not doing so are equally real. Taking advantage of the flexibility offered by CallScripter can keep you ahead of the competition. Regulation will evolve, and it is vital to use a solution that can cope with change seamlessly. Use the strengths of CallScripter Synergy to give your business both protection and a competitive advantage. Having our contact centre on site, we understand better than most how crucial it is to get new agents on the floor quickly. High staff turnover rates coupled with lengthy training times can result in lost revenue for contact centres. CallScripter’s simple to use agent desktop means that training times can be reduced by up to 50%, increasing the overall productivity of your contact centre operation. CallScripter’s aim is to provide customers with software that is easy to implement, simple to use and allows you to deliver the best possible experience for your clients. To ensure that this happens, we offer a comprehensive support system via our team of experienced Professional Services Consultants. Our experts will guide you through the implementation process, provide training delivered through your preferred method and offer continued support and consultancy should you need it. You can learn more about our support services here.